The city of Cluj, heart of the important Romanian region of Transylvania, enjoys a diverse cultural tradition: its University dates from 1723 and music has been printed here as early as the sixteenth century. 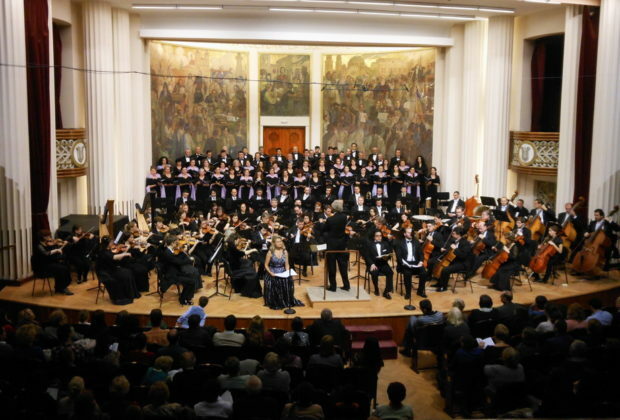 It is therefore no wonder that, in less than ten years after its establishment, the young orchestra became one of the top symphonic ensembles in Romania. The main figure to have made this possible was the orchestra’s first conductor, Maestro Antonin Ciolan. Fascinating personality, to which the Orchestra owes the brightness and maturity of their sound, Antonin Ciolan was also a professor at the Conservatories in Iaşi and Cluj, as well as founder of the Philharmonic Society of Bessarabia and Iaşi Philharmonic. He studied in Dresden, Berlin and Leipzig, under Arthur Nikisch and Hans von Bülow. He spent his entire career striving for excellence, an aim he passed on to his disciples: Petre Sbârcea, Emil Simon, Ervin Acel or Erich Bergel. It was a wonderful opportunity for the newly founded orchestra to benefit, in the first decade of its existence, from this great conductor’s experience and knowledge, artistic capacity, enthusiasm and devotion. Maestro Ciolan was taken further by two of his most accomplished disciples, conductors Emil Simon (principal conductor of the orchestra between 1960 and 2000) and Erich Bergel (principal conductor between 1966 and 1972, Honorary Artistic Director from 1994 to his death in May 1998). They brought their contributions to the growth and refinement of the orchestra and the expanding of the programmes towards late Romantic and twentieth-century music. Later, the position of principal conductors of the Philharmonic was held by Cristian Mandeal, Nicolae Moldoveanu and Mihail Agafiţa. Emil Simon was one of the most important Romanian conductors. His musical training was closely supervised by Antonin Ciolan (conducting) and Sigismund Toduţă (composition). In 1964 he was the winner of the Grand Prize of the Besançon International Conducting Competition. He continued his studies in Paris, with Nadia Boulanger, Olivier Messiaen (musical analysis) and Manuel Rosenthal (orchestra conducting) and worked closely with Sergiu Celibidache, in Stockholm, Prague and Paris. Emil Simon was the principal conductor of the Philharmonic for a time of forty seasons, during which he enriched the experience of the ensemble. He appeared in more than 1500 concerts, conducting over 3000 works, including an overwhelming number of world premieres of Romanian pieces. Principal Conductor of the Târgu-Mureş Philharmonic (1977/1980), Cluj Philharmonic (1980/1987) and “George Enescu” Philharmonic (1987/2009), Cristian Mandeal has appeared with some of the world’s most famous orchestras: Wiener Oper Orchester, Deutsche Oper Orchester Berlin, Staatskapelle Berlin, Staatskapelle Dresden, Dresdner Philharmonie, Münchner Philharmonie, Bayerisches Rundfunk Orchester, Hessisches Rundfunk Orchester, Oper und Museumsgesellschaft Orchester Frankfurt, Südwest Rundfunk Orchester Baden Baden and Saarbrücken, London Symphony Orchestra, London Philharmonic Orchestra, BBC London Orchestra, BBC Scottish Orchestra Glasgow, City of Birmingham Symphony Orchestra, Royal Philharmonic Orchestra Liverpool, RTE-Dublin, Orchestre Nationale de Belgique, Czesch Philharmonic, Prague Symphony Orchestra, Prague Radio Orchestra, the RTV Slovenia Symphony, Orchestra della Santa Cecilia, RAI Milano, Orchestra National de Catalunia in Barcelona, Israel Philharmonic Orchestra, Jerusalem Symphony Orchestra, Gulbenkian Orchestra, Portuguese Symphony, the Philharmonics in Tokyo, São Paulo, Ciudad de Mexico, Helsinki, Monte Carlo, Copenhaga, Moscow, Warsaw, Sofia, Belgrade, Zagreb, Göteborg Symphony Orchestra. Since 2008, Cristian Mandeal has been regularly training and conducting the Romanian Youth Orchestra. Principal Guest Conductor between 2008 and 2012, Nicolae Moldoveanu studied conducting with Wilfried Boettcher, Horst Stein, Ralf Weikert and Antal Doráti at the Musikhochschule in Zürich, Basel and Bern, also attending master classes with Lothar Zagrosek and Sergiu Celibidache. In the UK, whilst at the Royal Academy of Music in London, his teachers included Colin Metters, George Hurst and Sir Colin Davis. He also took part in master classes with, amongst others, Ilya Musin, Leonard Slatkin and Sir Roger Norrington. His recent and forthcoming engagements include conducting the Malaysian Philharmonic Orchestra, Orchestra of the Royal Opera House, Royal Philharmonic Orchestra, City of Birmingham Symphony Orchestra, Hallé Orchestra, BBC National Orchestra of Wales, English Chamber Orchestra, Scottish Chamber Orchestra at the Edinburgh Festival, Ulster Orchestra, Royal Scottish National Orchestra, Melbourne Symphony Orchestra, National Philharmonic Warsaw, Nordic Chamber Orchestra, Philharmonie de Lorraine, Prague Radio Symphony, Tokyo Symphony Orchestra and Iceland Symphony Orchestra. Between 2009 and 2013, the position of Principal Conductor was assumed by Mihail Agafiţa, with which the Orchestra performed dozens of concerts, with a special focus on Russian repertoire. His guest conducting engagements include ensembles from Romania, the Republic of Moldova, Spain, Finland, the United States, Italy, Russia, Poland, Czech Republic, Ukraine, and Belarus, as well as concerts in Greece, Portugal, France, Monaco, Malta and Tunis. He appeared with the Moscow Philharmonic Orchestra, “George Enescu” Philharmonic, the National Radio Orchestra of Romania, the National Philharmonics of Belarus and Republic of Moldova, the Philharmonic Orchestras of Iaşi, Târgu Mureş, Oradea, Braşov, Sibiu, Bacău, Craiova, Botoşani, Ploieşti, Satu Mare, Orquesta de Extremadura (Spain), Pori Sinfonietta (Finland), Owensboro Symphony, Great Falls Symphony and Ohio University Symphony Orchestras, the Sankt Petersburg State Ice Ballet, the Chişinău National Opera and Ballet Theatre, the Academic Opera and Ballet Theatres from Kharkov and Dnepropetrovsk. The position of principal conductor is currently held by Gabriel Bebeşelea. With over 120 recordings, mainly released by Electrecord, The Transylvania Philharmonic presents what is perhaps the largest discography among Romanian orchestras, featuring some of the finest artists of the country – the conductors Antonin Ciolan, Emil Simon, Erich Bergel, Cristian Mandeal and Mircea Cristescu, the pianists Valentin Gheorghiu and Dan Grigore, the violinists Ştefan Ruha and Mihaela Martin. It reflects the entire range of the orchestra’s wide repertory, from Baroque to contemporary music, including impressive series such as the complete Brahms and Bruckner symphonies, as well as works by Debussy, Ravel, Wagner, and Vivaldi. During its first ten years of existence, the young Cluj Philharmonic Orchestra developed into an ensemble with a strong personality, with a substantial and continuously expanded repertory. As a natural consequence of its international recognition, the orchestra was invited to perform concerts in the most important European concert venues. The first tour abroad took place in the former Yugoslavia, in 1964. Successful tours followed in the former USSR (1966, with memorable concerts in Moscow and Sankt Petersburg). Its first Western tour took place in 1968 in Italy; and it was also in Italy where one of the Orchestra’s most famous international performance took place – the Beethoven jubilee festival, performed both in Pesaro and Torino, in 1970, under the direction of conductors Emil Simon and Erich Bergel. After 1970, the Orchestra has been regularly to tour in Poland, Hungary, Bulgaria, Czechoslovakia, USSR, Germany, Austria, Holland, Switzerland, Italy, Spain. The 1980s witnessed a progressive decrease of the international presence of the ensemble, due to the cultural isolation imposed by the communist authorities during the last years of dictatorship; after 1989, the hard work to rebuild the international renown has been highly successful, both through the high frequency of the artistic projects and the remarkable significance of some of them. The artists returned on stages in France, Belgium, Italy, Germany, Switzerland, Hungary and most of all in Spain, with repeated presences in the Santander Festival, as well as collaborations with important names, such as José Carreras, Angela Gheorghiu, Roberto Alagna and others. Though it is mainly focused on symphonic and vocal-symphonic programmes, the orchestra also pays special attention to the opera repertory. Remarkable in this respect is George Enescu’s opera Oedipe, presented on the composer’s centennial celebration (1981) at the Lucerne Festival. The orchestra was invited to opera productions organized by the famous Red de Teatros in Spain: Desvan Verdi (2001) and La Rebelion des los criados (2002). The orchestra was also guest of the Santander Festival, with productions such as Verdi’s Simone Boccanegra (conductor Antonello Allemandi, director Petrika Ionescu) or Mozart’s Don Giovanni (conductor Marco Armiliato). A singular project brought together the Cluj orchestra and the „Deep Purple” rock band, in an ample tour in 2000. Conducted by Paul Mann, they performed John Lord’s Concerto for Rock Group and Orchestra, in cities and venues like Antwerpen, Kongresszentrum Hamburg, Trondjheim, Göteborg, Globe Arena Stockholm, International Congress Center Berlin, Praga, Luxembourg, Palais des Congrès Strasbourg, Festhalle Frankfurt, Schleyer-Halle Stuttgart, Zürich, Madrid, Filaforum Milano, Le Palais des Congrès de Paris, Wiener Stadthalle, Westfalenhallen Dortmund, Rotterdam, Olympiahalle München, Katowice. In recent years, festival appearances include Lucerne, Bucharest, Torino, Warsaw, Istanbul, Santander, Strasbourg, Bratislava, Berlin and Interlaken festivals.